More than 2 million students nationwide prayed in in front of their schools Wednesday for the annual “See You at the Pole” observance, now in its 21st year. Coordinated by the National Network of Youth Ministries in San Diego, the event is youth-led by design and takes place each year before the school day begins. Local youth ministers from a variety of denominations encourage their youngsters — kindergartners through high schoolers — to show up for school early and pray at the flagpole. While hundreds of students across Sumner County will gather at their school’s flagpole for prayer Wednesday morning for See You At The Pole Day, school officials have taken extra measures to ensure teachers, administrators and coaches do not publicly endorse religion. In anticipation of the global annual event that serves to encourage prayer for students, Sumner school officials recently distributed guidelines telling school staff if they choose to pray on campus, it must be done out of sight and earshot of students. “When a teacher or administrator participates in events such as See You At The Pole, it is possible for a student to confuse a teacher or administrator’s personal speech with their official speech,” the guidelines state. The policy change has created some frustration among coaches and administrators, said Jason Cline, area director of the Northern Middle Tennessee chapter of Fellowship of Christian Athletes. “I think the coaches have been told so much about what they can’t do, they’re not sure about what they can do,” Cline said. 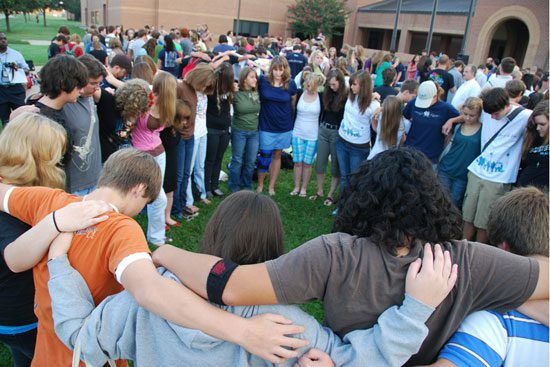 A group of teenagers in Burleson, Texas, is credited with the “See You at the Pole” concept in 1990. “They came seeking God and little did they know how powerfully He was about to move,” notes a press release from the youth ministers network. 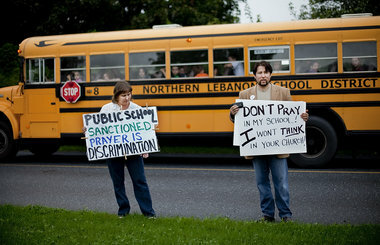 “Compelled to pray, they drove to three different schools that night. Not knowing exactly what to do, they went to the school flagpoles and prayed for their friends, schools, and leaders. ” Those students had no idea how God would use their obedience. 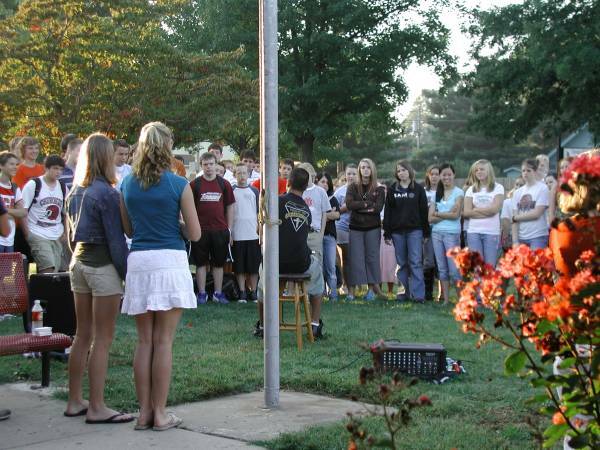 On September 12, 1990, more than 45,000 teenagers met at school flagpoles in four different states to pray before the start of school. Reports came for days after the first event. On September 11, 1991, at 7:00 a.m., an estimated one million students gathered at school flagpoles all over the country. This year, the event occurred in every state of the Union as well as in Canada, Korea, Japan, Turkey and the African nation of the Ivory Coast. With a heavy fog hanging in the air, about 300 Oak Mountain Middle School students huddled on the football field to pray this morning before school. An estimated 30,000 Christian students gathered before school at more than 200 public schools across central Alabama in observance of “See You at the Pole” day. The “See You at the Pole” event, which began at a Texas school in 1990, usually lasts from 7:15 a.m. to 8 a.m. before students go to class. More than two million students are estimated to take part each year. The movement toward religious clubs meeting on campus and organizing prayer rallies before school gained steam after the 1984 Equal Access Act granted student-led religious clubs the same right to meet on campus as other clubs. The law was upheld by the U.S. Supreme Court in 1990.